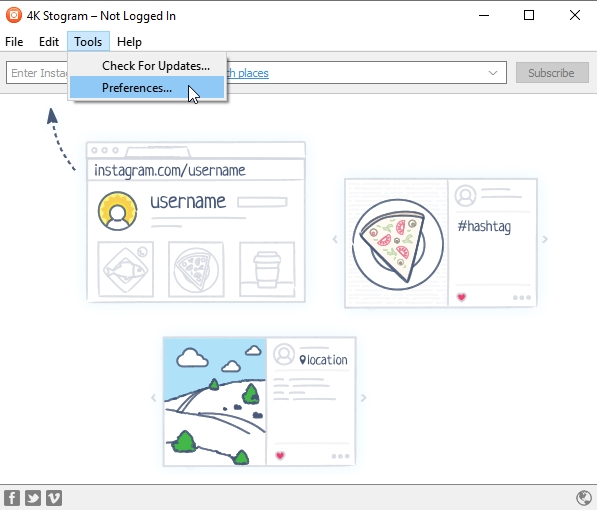 Download Saved Posts from Instagram on your computer. 1. Download and install 4K Stogram. It’s available for macOS, Windows and Linux. 2. Run the app, click Tools and then Preferences in the left top corner. 3. Enter your Instagram username and login. Don’t worry 4K Stogram doesn’t store your password, it is used only once to request the access token from Instagram. 4. Click Edit and then Subscribe to My Saved Posts. 5. Enjoy how your Saved Posts get downloaded to computer immediately! Don’t hesitate, later on all newly added Saved Posts will be downloaded automatically onto your computer!